In ultrafast analysis, external column dispersion affects peak resolution. The SR-Cell in the SPD-M30A has minimized the cell volume to realize excellent peak shape with higher peak resolution, supporting genuine UHPLC analysis. The SPD-M30A provides unrivaled spectrum resolution by adopting an optimized optic system. In addition, the new signal treatment technology realizes excellent spectrum linearity across a wide area from low concentration to high concentration. The SPD-M30A supports analyses, such as purity analysis, that require a wide dynamic range. Nexera SR is configured with the new SPD-M30A photodiode array detector. The new peak calculation technology, i-PDeA (Patent pending), proposes a new approach for separation of co-eluted peaks and extraction of impurity peaks from main peaks. 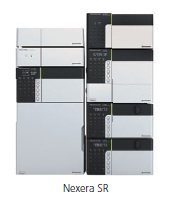 The superior sensitivity and resolution expand the range of UHPLC analyses.